I love this time of the year so much. It has always been my favorite time. What more is there to love about this time of the year other than food? The beginning of October also brings back so many memories of various halloween costumes throughout my life. Growing up, beginning at the end of September and moving in to the beginning of October I would pour through sewing magazines looking for the best halloween costume. My mom has this amazing talent of sewing and always made the most elaborate costumes for my sisters and I. The only problem was: they were a little TOO good. Why is that a problem? Because we ALWAYS won the Neighborhood Costume Contests. To most kids this would be exciting. To me it was the source of much anguish (oh, the many problems during childhood). I thought it was soooo embarassing that we always won. I'm pretty sure my costume winnings caused the downfall of one of my 5th grade friendships. I don't really remember why it ended I just remember being on the bus with her and telling her that our friendship was no longer working. It must have been because of the costume contest. Actually one year I do remember losing. It was to a kid who dressed up as Steve Urkel. I am most definitely a product of the 90's. Now that I am older I miss picking out a costume for my mom to make, and watching anxiously as she would sew a little more each day until she came up with the final product. Halloween before Haley was born. I am a Hershey Kiss, Kati is a clown. Yes I am crossing my eyes. I kept things interesting for my mom. A couple of years later. I was Dorthy from The Wizard of Oz, Kati was a candy corn and Haley was minnie mouse. This was 5th grade, the year the bus saga went down. Also I have no idea why I have tape around my fingers. I'm sure it has nothing to do with the fact that my family thinks I am a hypochondriac. The next year. 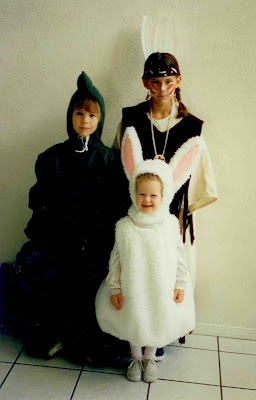 I was Sacajawea (long story, you can find it here), Kati was a dinosour, and Haley was a cute little bunny. 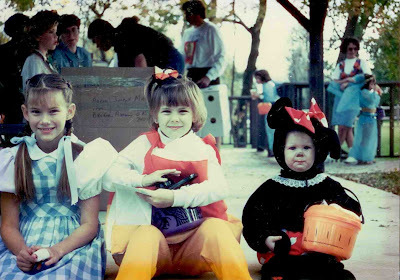 What was your favorite Halloween costume as a child? Oh, you guys were adorable.. and your Mom is very talented..
One year I dressed as Raggedy Ann and I won a contest. It was fun. But the must fun costume I wore was in college.. I dressed in a Navy Blue Sweat Suit. Glued Yellow felt stars all over myself and when people asked me what I was.. I would shoot them with a water gun. I was a shooting star..lol. It was to fun. Oh those costumes are so cute! I remember when I was little my mom always made our costumes - we never bought them. We had some original costumes, too! One year when I was about 7 I was a "teenager" which was fun! I was a scarecrow(because my mom made me) one year and I was also an ice skater complete with the outfit and skates over my shoulder. That was the year of the aforementioned bday party where I bit the ice - literally! Happy October! LOVE the pictures!!! Ya'lls faces in everyone are classic. The only costume I really remember as a child was a borrowing a pumpkin outfit from my grandmother. Because I was very cool like that. And it will probably not surprise you that in college I dressed up as a Subway worker. It killed. I love those pictures! It reminds me so much of my Halloween costumes as a child. I think my favorite was a unicorn with the headpiece and everything. Aww...the days of dressing up in complete innocence. I love your blog! You're pics took me down my own memory lane thinking back! Good times! I love the Dorothy costume! You were adorable! Soo cute!! My mom always said she would so us stuff...we're still waiting, ha! love yalls facial expressions in those pics! too cute! Thanks for sharing those pics - so cute! I dressed as a nun and a skunk when I was younger - they were both pretty fun. My mom got really into it too! Those are awesome costumes! I don't remember many of my childhood Halloween costumes! Am I old or what?!?!?! I am so glad you shared pictures! Your mom really went all out and you guys look great! The one of you as Dorothy is precious! I only remember being a cheerleader for Halloween. Pretty lame, huh? I love your pictures, they are so adorable! My fave was probably when I was about 3 I was Raggedy Ann and then later in elementary my mom made me a southern belle outfit, I thought I was gorgeous! These are SO funny!! I have a pic Zack's mom gave me one year, back when we were dating, of him as a Ninja Turtle..he was totally into the character...I love it! I recently stumbled upon your blog, I love your costumes! I am so happy it's fall..I Can't wait until the weather follows suit so the hubby and I can light a fire! You were so lucky to have such a talented mom! My favorite Halloween costume was Rainbow Bright. I was so cute...If I can say so myself! 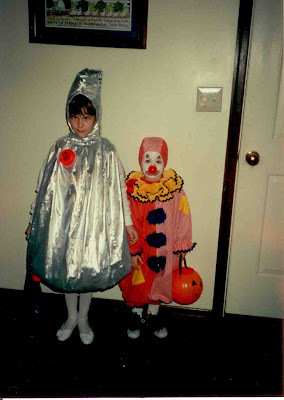 i was a hershey's kiss for halloween for my first halloween! These pictures are precious! You were just as cute THEN as you are NOW! Thanks for sharing!